On this avenue thronging with stylish businessmen and meandering tourists, Passeig de Gràcia exudes a feeling of grandeur and opulence. This influential street boasts a Modernist architectural heritage with the names of Gaudí, Domanech i Montaner, and Puig i Cadalfalch –and it’s a fashion mecca in Spain. Here’s a guide on how you can enjoy the best sights that this glamorous promenade can offer. 1. 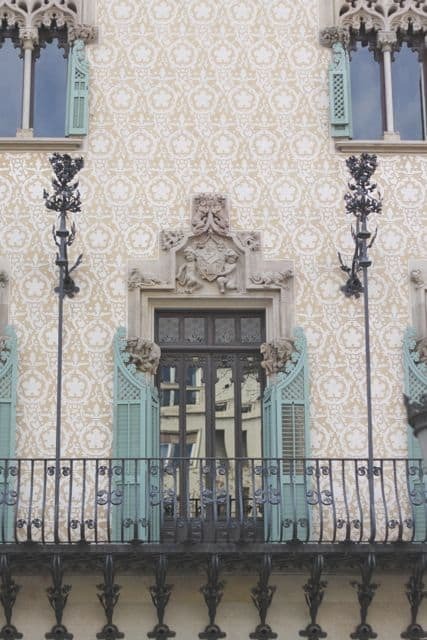 Admire the lavishness and details of Catalan Modernism. 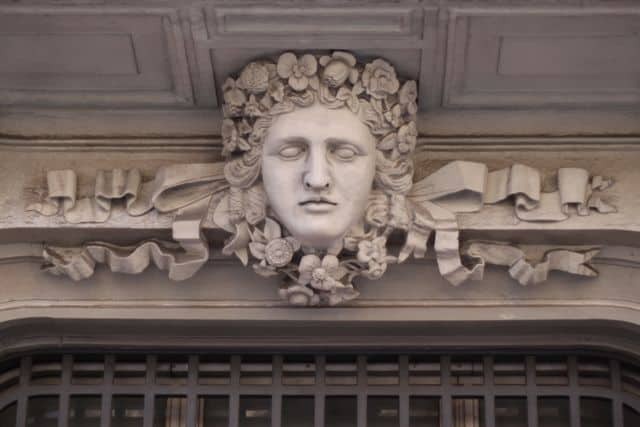 Admire more Modernist adornments on building facades. 3. Visit the starring architectural gems, the buildings by Gaudí. 4. Enjoy a meal or a cup of coffee. 5. Stay at a luxury hotel (or just admire its exterior). Elements of curved lines and elaborate details are folded into the Modernist urban streetscape. 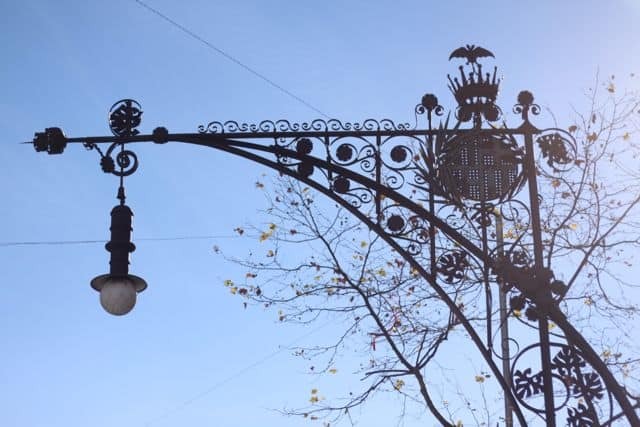 There are 32 of these lacy iron streetlights, tethered down by a bench decorated with trencadís (a mosaic of ceramic pieces stuck to mortar). It was designed by architect Pere Falques i Urpí in 1906. On this same structure hangs a cantilevered lamp. Can you see the bat? 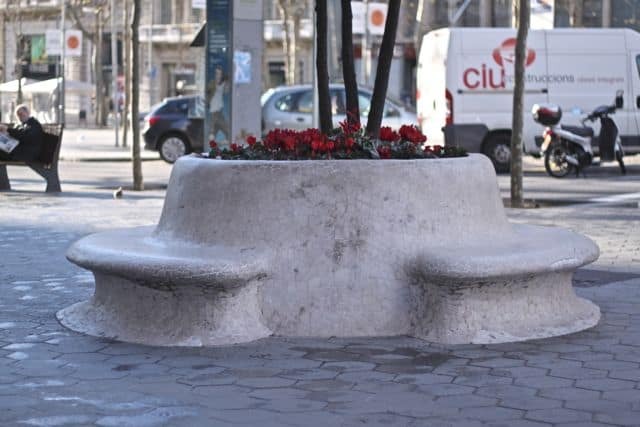 These circular benches made of broken tiles surround a flower bed, built in 1974 for your people-watching pleasure. 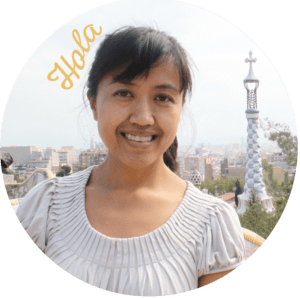 When walking down the street, you’re stepping one of Gaudí’s designs. These hexagonal pavement tiles showcase his love for natural features: a sea starfish, snails, and seaweed. 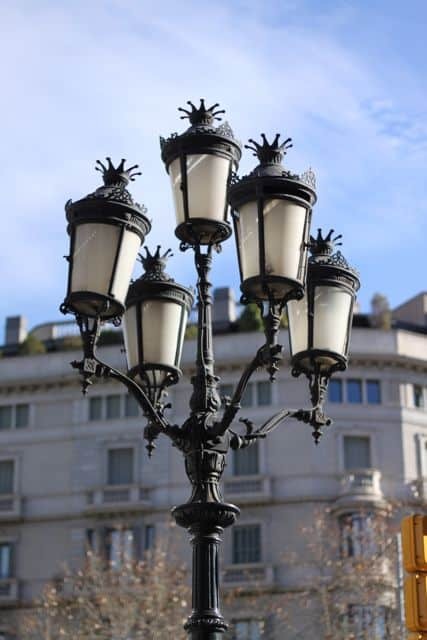 A multi-branched cast iron lamp fixture lights the streets for some evening romantic ambiance. 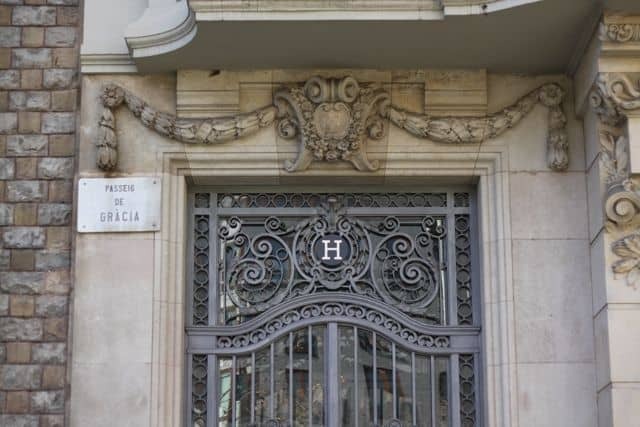 While there are several famous and notable Modernist buildings on this street, you can find these elements on businesses, office buildings, or even residencies. Modernism around the turn of the century was all about the ornate — and expressing the richness of ornamentation. The next-door neighbor to the infamous Casa Batlló, Casa Amatller (No. 41) boasts an urban Gothic style and was constructed in 1900. Love those shutters. 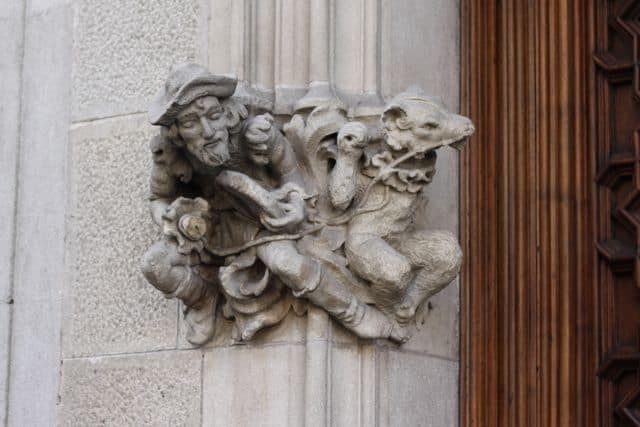 Design features of the building tell a story, using symbolism in Catalan mythology. 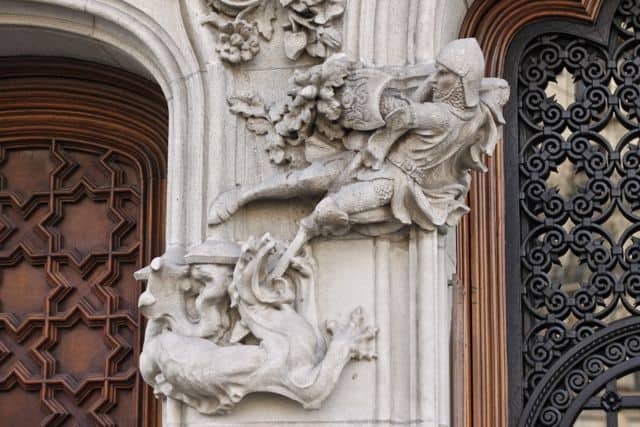 San Jordi, the patron saint of Catalonia, fights the dragon, as legend has it. The building which houses Loewe (No. 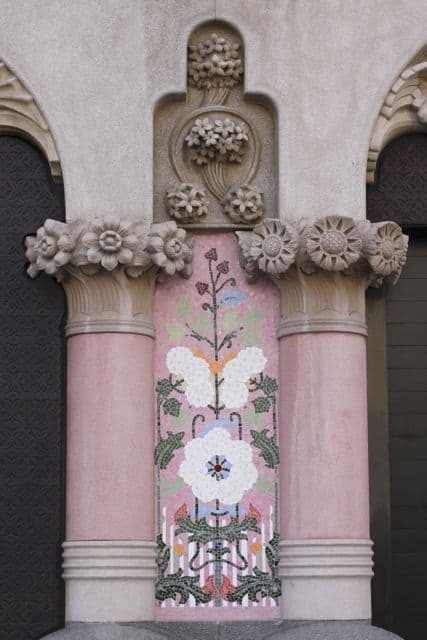 35) displays a feminine flower motif with gorgeous tilework. So decadent. A flower chain banner hangs above this intricate doorway. Casa Batlló and Casa Milà are the main tourist draw of Passeig de Gràcia, forming winding tourists lines during its busiest hours. Casa Batlló (No. 43). Named a Unesco World Heritage site in 2005, this emblematic building by Gaudí was built to jazz up what was a ho-hum apartment block. The facade uses a mishmash of materials like forged iron, bricks, stone, and ceramics. Its mauve and turquoise tiles imitate that of a reptile’s skin. Casa Milá (Provença 261-265, but it’s on the strip), or more popularly known as La Pedrera (stone quarry). Also a Unesco World Heritage site, this building takes up a whole street corner and houses the Fundació Caixa Catalunya. But as you can see in the photo, sad news for Gaudí lovers. The exterior is under construction, so photo opps are pretty pitiful right now. 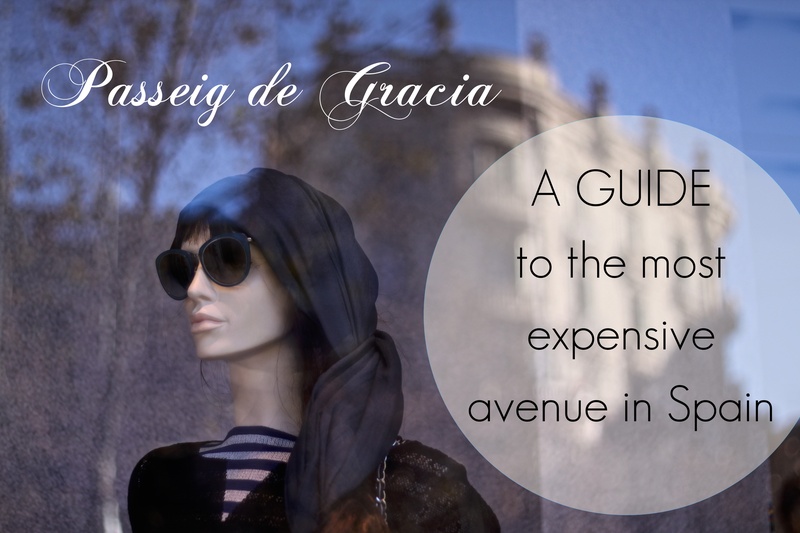 Passeig de Gràcia has designer names in haute couture, but along the 5-kilometer stretch, you can shop a variety of price points that won’t empty your wallet. Bulevard Rosa (No. 53) is also mall of over 110 boutique-style shops, many of them independent labels. And there are still more shops on the strip! Gratacós (No. 110). Okay, so I don’t really go inside, and I think I may have entered this luxury fabric store once. But for fashion addicts, their chic and contemporary window displays are an experience in itself. The fabrics drape artfully in the window, and a mannequin dons a runway-quality look that feels exclusive and high fashion as many famous celebrities adorn their exquisite fabrics. Vinçon (No. 96). You can spend at least a good half hour strolling through this spacious design and housewares shop with sleek and contemporary lifestyle products. It also has a great toy section, witty gifts and other unique novelty items. You’ll probably come out having bought something too. Imaginarium (No. 103). Not really a fashion store, this one’s a shoutout to the parents and kids. I remember these attractive toy stores in every mall in the US! This Spanish brand sells quality educational toys from babies to 12 years old, nevertheless in very handsome design. Products include toys, books, and kids’ furniture. It also offers a kids’ hair salon, a play area, and a Danone yogurt shop. Moments (No. 38). This restaurant is inside the Mandarin Oriental Hotel. It has a stylish dining room and two Michelin stars. Santa Eulàlia (No. 93). A local clothing store primarily, the top floor terrace holds a restaurant/cafe with a fun view of Barcelona. Buenas Migas (No.120). I’ve come to this casual Catalan-owned restaurant/cafe chain for a coffee and a chat. My favorite is the scone (which you can ask to have warmed up), and you can help yourself to the tasty melmelada fixings at the bar. Not really a place for a warm meal, they have some salads, quiches, and foccacia sandwiches, which are pre-made. There are several high-end hotels on this strip. But if you want to get fancy, here are 5-star hotels where you can be treated like a king or queen. Hotel Casa Fuster (No. 132) is a boutique hotel in a renovated modernist building at the end the avenue. Don’t worry about the top-hat-wearing guy standing outside who looks like he’s going to a costume party. He’s just a snazzy-looking doorman waiting to help guests as they arrive. Hotel Majestic. 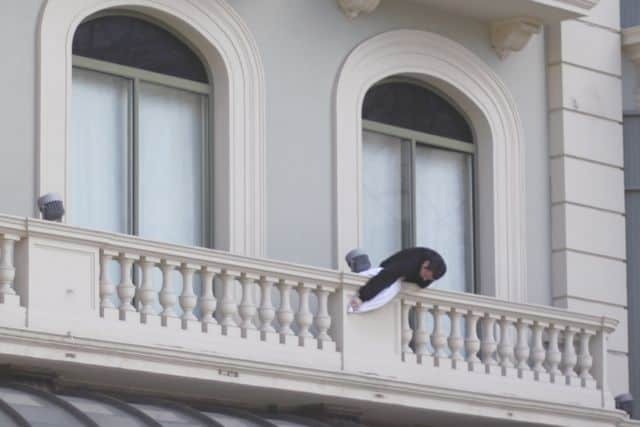 A cleaner ensures the balcony passes the White Glove Test. Hotel Majestic (No. 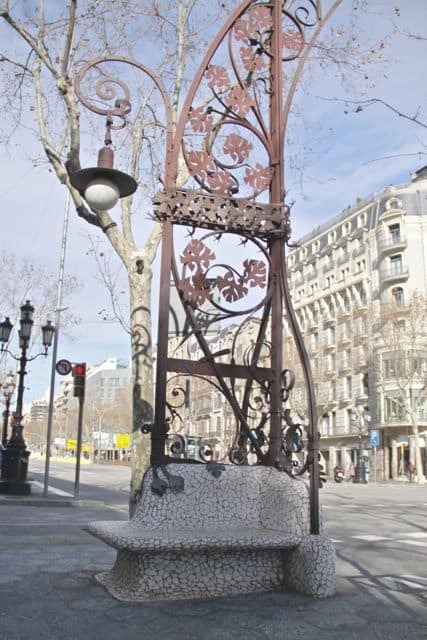 69) has been here for 90 years and occupies a whole corner of Passeig de Gràcia. It has a lovely terrace at the top with spectacular views of the city. Hotel Mandarin Oriental (No. 38-40) This hotel opened in 2009. They have an impressive lobby that you can walk around and ogle at the modern design. Just don’t take photos…they’re weird about that. They also have a spa and five restaurants and bars. Hotel Eurostar BCN Design (No. 29) is a 65-room hotel with contemporary design. It also have a lovely rooftop view of the busy avenue. Safety. It’s no secret that Barcelona is replete with pickpockets. The morning I took these photos, an undercover policeman stopped to assist two foreign tourists who had just had their wallets stolen from their purses. Take caution! Transportation. Metro stations nearby are L2 and L3 (Passeig de Gracia stop) and L5 (Diagonal). Buses 7, 16, 22, 24, and 28. And more shopping! There’s still plenty of designer shops around Rambla Catalunya and Diagonal. It doesn’t end! One more spot! Palau Robert (No. 107) always has free and interesting exhibitions. It’s worth a trip just to enter the decorative building. Inside, there’s tourist information and a book shop. It also has a quaint garden with lots of seating area. I just scratched the surface, but I hope this mini tour helps somehow. Enjoy Passeig de Gràcia!